Our Vacuum Cup Orifice Adapters are the low cost solution to preventing workpieces from dropping during transfer and for minimizing vacuum loss. The orifice adapter is ideal for use in cases where suction cups fail to pick up a workpiece. The use of a single orifice adapter reduces vacuum loss and ensures the other cups in the line securely hold workpieces. 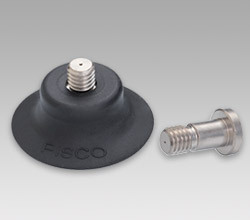 Our Suction Cup Orifice Adapters are designed for use with Pisco suction cups only.